Similarly, like the Attic and Basement, the Bathroom of a home is also considered an area that prompts a lot of concerns as far as the topic of mold. Within the bathroom the opportunity to utilize the options of hot and cold water can be considered as a necessary convenience, unfortunately this convenience also is a source for abnormal mold growth. The opportunity of having heated water increases the potential of excess humidity within one’s home, this is as, excess humidity tends to develop exponentially within properties that experience changing weather patterns. An example of such is displayed when an individual utilizes hot water within winter months and the excess steam is visible on a mirror. Have you ever noticed that after a warm shower once you wipe the fogged mirror that the vapor has now become saturated and has transitioned to water droplets? 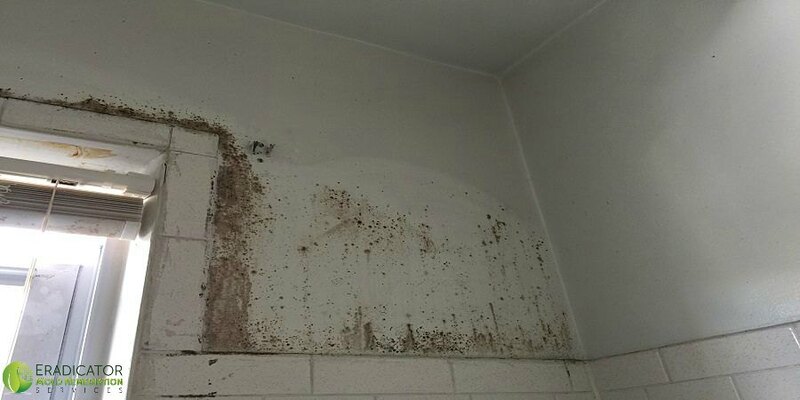 Examples such as this are reasons for bathroom mold growth. A ruptured pipe or toilet that “sweats” may also contribute to your bathroom having excess water as well as contribute to mold issues within this part of the home. Excess water has the potential to increase humidity within this area of the home as well as comprise cellulose materials. This can be further complicated when excess water seeps from one area of the home to an additional part of the home. Eradicators’ mold inspectors tend to notice that bathrooms within buildings/homes that have multiple floors can be devastating if the issue started from a floor higher up, this is as the excess water will compromise the tile floor and seep into the lower floors. 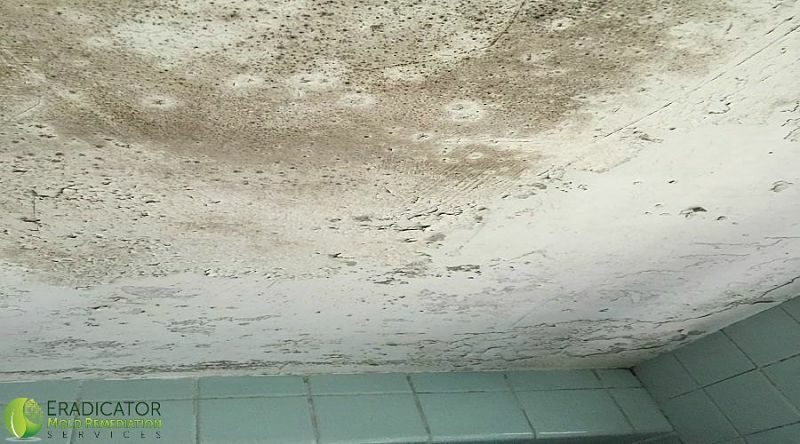 This excess water will more than likely affect the floors beneath it as the ceiling drywall and wooden beams of the other floors have now become saturated and has the potential to cause abnormal bathroom mold growth. Bathroom Fans provide a solution of resolving excess humidity within this area of the home. This equipment is utilized to remove excess humidity by funneling the water vapors from this area to the exterior of the home. This is necessary to ensure that building materials and personal items within this part of the property, that is susceptible to bathroom mold growth, are not compromised for example drywall, grout between tiles, and so on. Windows within bathrooms are also a solution to remove excess humidity within a bathroom. The issue that this may cause is the inconvenience that may result. This inconvenience is especially affected by individuals within changing weather patterns that may not find it suitable to open windows within winter months. Excess water that may have resulted from a leaking toilet, a burst pipe, and so on within a bathroom should always be attended to immediately. Excess water/humidity that are caused from taking a warm shower within the winter months should also be addressed by utilizing a bathroom ceiling fan that is vented to the exterior of the home. If you are concerned about a possible mold issue within the bathroom of a property feel free to contact Eradicators’ personnel. One of our competent Mold inspectors will review the areas of concern, assist in determining if mold testing is necessary, and if mold remediation is needed. We will also help in determining if areas of concern and items susceptible to mold growth can be restored or should be replaced.